The Viewpoint is authored by Jim Barbaresso, HNTB national intelligent transportation systems practice leader and senior vice president. A new HNTB Corporation Viewpoint discusses the future impacts of connected and autonomous vehicles on urban design and mobility. The Viewpoint includes thoughts about a concept called “nomadization,” which involves people who may one day live and work in autonomous vehicles. 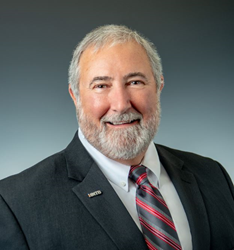 The Viewpoint, “Transportation technologies accelerate urban redesign and enhanced mobility,” is authored by Jim Barbaresso, HNTB national intelligent transportation systems practice leader and senior vice president. According to Barbaresso, if autonomous vehicles eventually become one of the primary modes of transport, people may be able to work, eat and sleep while occupying their vehicles, or even live on the road as futuristic nomads. Houses may be substituted for autonomous modules on wheels, turning upside down our concept of normal residential life in cities nationwide. To see more HNTB thought leadership and media content, visit the firm’s connected and automated vehicles media kit.